When an object vibrates in air, the air molecules are pushed and pulled by the object. This creates alternating high and low pressure areas that pass through the air in the form of sound waves. Think of these high and low pressure areas as vibrations in the air. Sound waves can pass through other mediums (such as wood and water) as well. Basically, any object that can be vibrated can convey or produce sound waves. When humans refer to sound, they are usually referring to sounds that are registered by the ear. 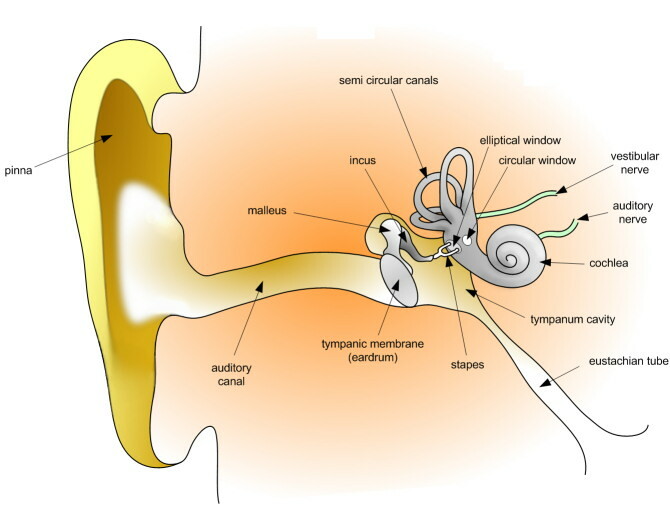 When sound waves enter the ear, they travel up the ear canal, and hit the ear drum. The ear drum vibrates, and allows the three smallest bones in the human body to start working. These bones (ossicles), cause vibrations in the fluid in the inner ears sensory organ, the cochlea. The vibrating fluid causes sensory hair cells to vibrate, which in turn send nerve impulses to the brain. The brain translates these impulses and we perceive sound. Where Can I Get Custom Noise Brakers? In order to obtain a pair of Custom Hocks Noise Brakers®, you will need to have impressions of your ears taken by a licensed audiologist, a licensed hearing aid dealer, or any medical personnel who are qualified to take an impression. Hocks Hearing Healthcare Products will take your ear impressions at no additional charge. Call 503-274-9482. You will find qualified personnel listed by state on our Authorized Dealer Listings. If you do not see one listed in your area, you can find someone who is qualified by looking for hearing aid dealers in your local area. If they have any questions, please have them call us at 503-274-9482. Please refer to How-To: Order Custom Noise Brakers. ﻿How long does it take to have a pair of Custom Hocks Noise Brakers made? Our earmold lab needs from four days to a week to make a pair of Custom Noise Brakers. The length of time is determined by the process and by the current work load in the lab. Do I need an appointment to have impressions taken at Hocks Hearing Healthcare Products? Yes, you will need to call 503-274-9482 for an appointment. Or you may email for an appointment: contactus@noisebrakers.com. Can I clean my Noise Brakers? Yes. Clean your Noise Brakers with warm water and liquid soap, such as Dawn Dishwashing Liquid. Rinse with clear water. I am a musician. Can I get custom Noise Brakers made in a color to match my drums? Can I get Noise Brakers in the same color as my motorcycle jacket? We will do our best to make your hearing protection in the color of your choice. We do not guarantee an exact color match. Can I visit your location to buy Noise Braker Standard hearing protection? Can I order by email and use my credit card, instead of ordering online? Yes, you may order Noise Braker Standards by email: contactus@noisebrakers.com. Please be sure to include your phone number and credit card information. You also may order using our Contact Us form, including your credit card information. The form goes directly to our email. Please use the Contact Us form for any questions, or give us a call at 503-274-9482. What is a Noise Braker? The Noise Braker is hearing protection utilizing the Hocks Noise Filter®﻿. The filter, inserted into hearing protection, allows air and sound to enter the ear, while protecting the wearer's hearing. The Hocks Noise Filter® is designed to reduce the intensity of sound waves as the sound waves get stronger. Hearing protection utilizing the Hocks Noise Filter® allows the wearer to carry on a normal conversation. The normal voice can be heard with a slight reduction of volume, while the background noise is filtered out to a greater extent. The Hocks Noise Filter® was created to help with these problems. The strength of hearing protection is given in its noise reduction rating (NRR). The NRR indicates the average number of decibels sound will drop when inserted into your ear. The actual number that decibels will drop varies greatly depending on the pitch (the highness or lowness of sound), and volume.